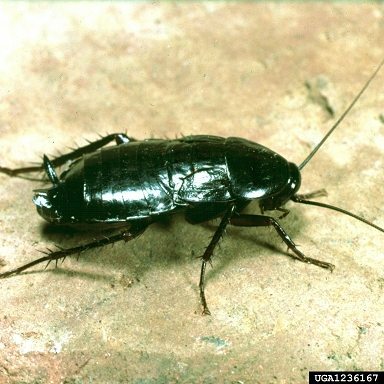 Oriental Cockroaches aren’t the MOST common Roaches in Phoenix Arizona metro areas, but live in our desert YARDS & can also infest INSIDE homes. Adult males are about 1″ & adult females are 1 1/4″ long. Male wings cover 75% of their body. Female wings are much smaller and like in the picture above look more like wing pads. Adult Oriental Roaches DO NOT fly. They like to be under debris, rocks, and in wall/porch voids. Oriental Roaches can survive long periods of freezing weather. Enter homes/building through: old door sweeps, under sliding glass doors, on utility pipes, on air ducts, & through floor drains. Oriental Roaches have a strong “Roachy” odor. They feed on filth, and decaying matter. Delivering EFFECTIVE Pest Control for Roaches in Mesa, Phoenix, Scottsdale, Chandler, Glendale, Gilbert, Queen Creek, Maricopa, & surrounding areas.